The neuroendoscopy devices market is expected to reach USD 218.9 million by 2022 from USD 163.9 million in 2016, at a CAGR of 5.1% during the forecast period. Factors such as favorable government initiatives, rising prevalence of neurological disorders, and benefits of neuroendoscopic surgery over conventional brain surgery are driving the growth of this market. However, the high cost of neuroendoscopy procedures and equipment may hinder the growth of the market. The base year considered for the study is 2016 and the forecast period is from 2017 to 2022. Neuroendoscopy procedures are increasingly being used for the treatment of a number of neurological disorders, such as pineal region tumors, pituitary tumors, Rathke's cleft cysts, skull base tumors, and ventricular tumors. Its use is also growing in neuro-oncology, conducting brain biopsies, and the treatment of hydrocephalus. According to GLOBOCAN 2012, the brain and nervous system cancer incidence rate was expected to increase by 6.6% from 2012 to 2015, globally. Similarly, according to the Global Burden of Disease Study 2015, neurological disorders were ranked as the leading cause group for disability-adjusted life-years (DALYs) in 2015 (approximately 250.7 million DALYs or 10.2% of global DALYs) and the second-leading cause group for deaths (~9.4 million or 16.8% of global deaths). Between 1990 and 2015, the number of deaths from neurological disorders increased by 36.7%, and the number of DALYs by 7.4%. As a result of the rising burden of neurological disorders, the number of neurosurgical procedures is growing across the globe. According to the NHS (2013), the number of neurosurgical procedures in the UK has been increasing steadily at an annual growth rate of 2–5%; in-patient hospital surgeries have reached 1,400 per million population in larger neurosurgical units, and operative caseload is typically 1,000 cases per million population. As neuroendoscopy is considered as the gold standard for brain cancer diagnosis and treatment, the growing prevalence of neurological disorders and the subsequent growth in the number of neurosurgical procedures are expected to support the growth of the neuroendoscopy devices market in the coming years. The study estimates the neuroendoscopy devices market size for 2017 and projects its demand till 2022. In the primary research process, various sources from both demand side and supply side were interviewed to obtain qualitative and quantitative information for the report. Primary sources from the demand side include various industry CEOs, vice presidents, marketing directors, technology and innovation directors, and related key executives from the various players in the neuroendoscopy devices market. 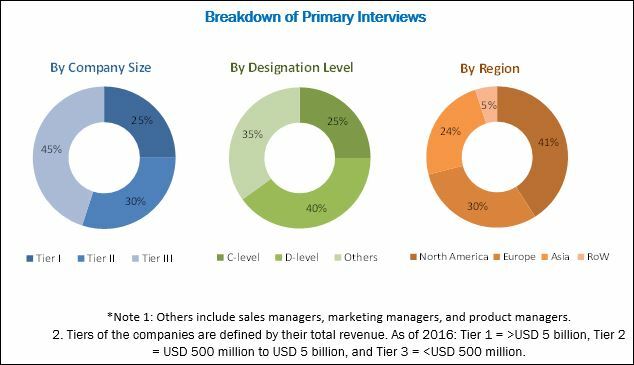 For the market estimation process, both top-down and bottom-up approaches were used to estimate and validate the market size of the neuroendoscopy devices market as well as to estimate the market size of various other dependent submarkets. Also, the study took into account the data shared by various associations and organizations such as World Federation of Neurosurgical Societies (WFNS), International Federation of Neuroendoscopy (IFNE), American Brain Tumor Association (ABTA), Indian Society Neuroendoscopy (ISNE), and International Federation of Societies of Endoscopic Surgeons. All possible parameters that affect the market covered in this research study have been accounted for, viewed in extensive detail, verified through primary research, and analyzed to get the final quantitative and qualitative data. This data was consolidated and added to detailed inputs and analysis from MarketsandMarkets and presented in this report. The neuroendoscopy devices market is duopolistic in nature, with two major players KARL STORZ (Germany) and B.Braun Aesculap (Germany). Other notable players in this market include Ackermann Instrumente (Germany), Adeor Medical (Germany), Hawk (China), Machida (Japan), Tonglu Wanhe Medical (China), Schindler (Germany), Clarus (US), LocaMed (UK), and Visionsense (US). In 2017, B.Braun opened a subsidiary in Zambia. This will help the company to establish its business in Zambia and expand its presence in the African region. Neuroendoscopy is a minimally invasive procedure that allows surgeons to perform complex brain operations through very small incisions using neuroendoscopes. A neuroendoscope is a small telescope-like device equipped with a high-resolution video camera and an eyepiece at the end to allow the neurosurgeon to navigate and access tumors in the brain. These instruments are used to illuminate, examine, and document difficult to access areas. Neuroendoscopic devices are used to perform operations for conditions such as obstructive hydrocephalus, various intraventricular lesions, hypothalamic hamartomas, craniosynostosis, and skull base tumors. Various types of neuroendoscopes are available in the market such as rigid neuroendoscopes and flexible neuroendoscopes. However, rigid neuroendoscope dominates the market, due to the benefits of rigid neuroendoscopes such as superior optics, reusability due to autoclaving, and high device strength. The global Neuroendoscopy devices market size is projected to reach USD 218.9 million by 2022, largely due to the favorable government initiatives, rising prevalence of neurological disorders. The benefits of neuroendoscopic surgery over conventional brain surgery are likely to propel further growth of Neuroendoscopy devices in the long-term forecast. The average list price of a neuroendoscopy system is as high as USD 10,000 to USD 15,000. Healthcare providers particularly in developing countries such as India, Brazil, and Mexico have low financial resources to invest in such costly sophisticated technologies. Moreover, healthcare staff needs to be trained for the efficient handling and maintenance of neuroendoscopy systems and equipment. This is a major issue as training costs for neuroendoscopic procedures are high. Considering the high cost of training, only a limited number of surgeons opt for undergoing training for neuroendoscopy (Source: Journal of Surgical Simulation). Owing to the high cost of equipment as well as the high training and maintenance costs, neuroendoscopy procedures are generally expensive. This is a major factor restraining the growth of the neuroendoscopy devices market. Future growth opportunities are going to be dependent on growing healthcare market in emerging economies such as Brazil, Russia, India, China, and South Africa (BRICS), as they are among the fastest-growing economies in the world. The World Economic Forum has estimated that these emerging economies will account for around one-third of the global healthcare expenditure by 2020. More than half of the world’s population resides in India and China, owing to which these countries are home to a large patient base. Transnasal procedures help surgeons to approach the anterior cranial base, parasellar region, clivus, cavernous sinus, and craniovertebral junction in a less invasive manner as compared to conventional neurosurgery techniques. Transnasal neuroendoscopy is indicated for biopsies, removal of cysts, and removal of pituitary gland tumors and other obstructions. 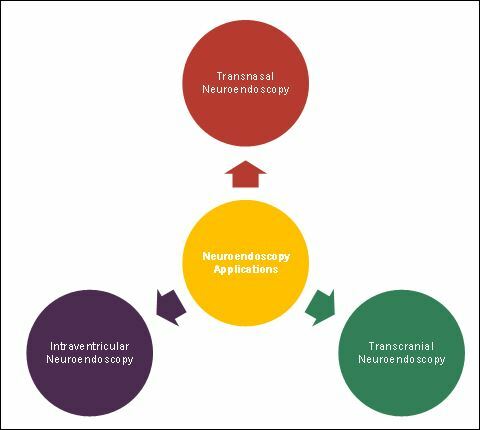 The advantages of transnasal neuroendoscopy include increased visualization with high light intensity in the deep-seated surgical field, clear display of patho-anatomical details, and extended viewing angle of neuroendoscopes (which enables surgeons to observe hidden parts of the surgical field). Neuroendoscopic surgery for intraventricular brain tumors is one of the major applications of neuroendoscopy. This approach is used in selective conditions, such as tumor biopsy, concordant CSF diversion, treatment of non-communicating hydrocephalus, management of pineal tumor patients, fenestration of intracranial cysts, and removal of fibroid cysts. Factors such as the ease of use, increased visibility, and treatment of a large number of neurological conditions will drive the growth of this segment. Transcranial neuroendoscopy is used in the diagnosis and treatment of larger tumors with significant suprasellar extension. There are two types of endoscopic transcranial approaches transglabellar or supraorbital which are widely used by neurosurgeons. The transcranial approach is more invasive as compared to the transnasal neuroendoscopic approach. However, in order to reduce trauma, this procedure is used in conjunction with transnasal neuroendoscopy. 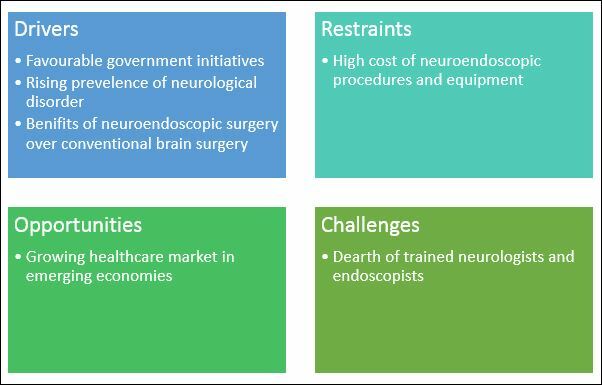 The Neuroendoscopy market is facing challenge of high cost of equipment & procedures, when will this scenario ease out? Most of the suppliers have opted partnerships and collaboration as the key strategies as could be seen from the recent developments. Where will it take the industry in the mid to long term? The global neuroendoscopy devices market is expected to reach USD 218.9 million by 2022 from USD 170.5 million in 2017, at a CAGR of 5.1% during the forecast period. Factors such favorable government initiatives, rising prevalence of neurological disorders, and benefits of neuroendoscopic surgery over conventional brain surgery are driving the growth of this market. The report segments the global neuroendoscopy devices market into product, application, usability, and region. Based on product, the market is classified into rigid neuroendoscopes and flexible neuroendoscopes. The rigid endoscopes segment is further divided into videoscopes and fiberscopes. The rigid neuroendoscopes segment is expected to grow at the highest CAGR during the forecast period. This high growth can be attributed to the benefits of rigid neuroendoscopes such as superior optics, reusability due to autoclaving, and high device strength. 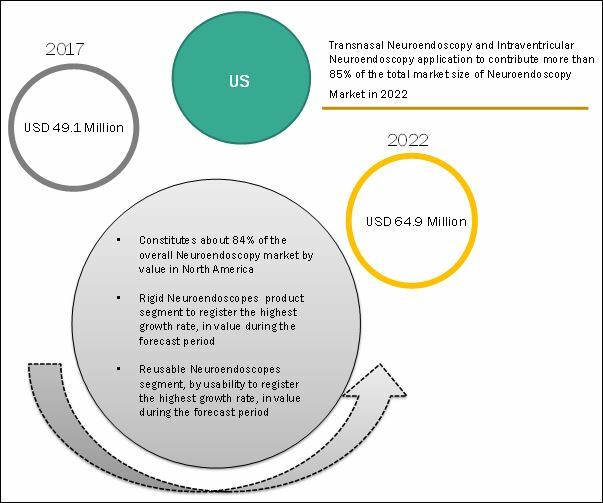 The global neuroendoscopy devices market, by application, is segmented into intraventricular neuroendoscopy, transcranial neuroendoscopy, and transnasal neuroendoscopy. The transnasal neuroendoscopy segment accounted for the largest market share in 2017. The large share of this segment can be attributed to the benefits provided by transnasal neuroendoscopy such as increased visualization with high light intensity in the deep-seated surgical field, clear display of patho-anatomical details, and extended viewing angle of neuroendoscopes (which enables surgeons to observe hidden parts of the surgical field). Based on usability, the neuroendoscopy devices market is segmented into reusable neuroendoscopes and disposable neuroendoscopes. In 2017, the reusable neuroendoscopes segment accounted for the largest share of the market. This large share is mainly attributed to factors such as cost-effectiveness of reusable devices as they can be used in multiple procedures after procurement. The market is dominated by North America, followed by Europe, Asia, and the Rest of the World (RoW). The dominance of the North American market is attributed to factors such as favorable government initiatives, rising prevalence of neurological disorders, increasing investments by hospitals to purchase new neuroendoscopy equipment, and increasing research activities. 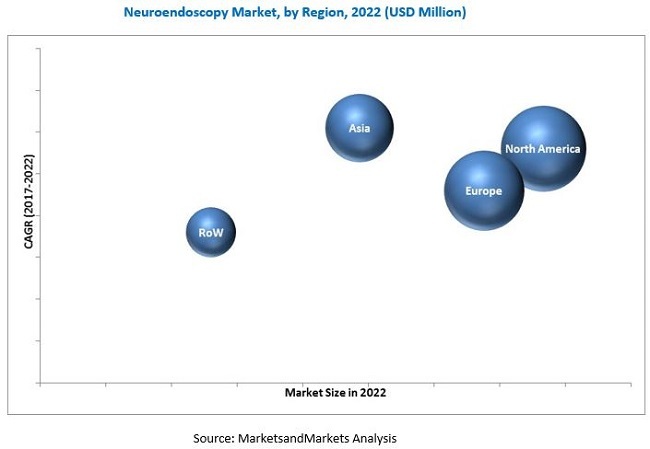 While the neuroendoscopy devices market represents significant growth opportunities, market growth may be hindered due to the high cost of neuroendoscopy procedures and equipment. KARL STORZ (Germany), B. Braun (Germany), Ackermann Instrumente (Germany), Adeor Medical (Germany), Hangzhou Hawk Optical Electronic Instruments (China), Machida Endoscope (Japan), Tonglu Wanhe Medical Instrument (China), Schindler Endoskopie (Germany), Clarus Medical (US), LocaMed (UK), and Visionsense Corporation (US) are the key players operating in this market.